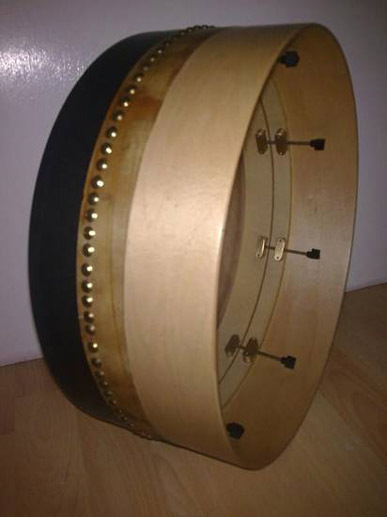 My bodhráns are constructed from laminated maple or birch plywood with adjustable birch plywood tone rings, to tension the skin, and allow for different climatic conditions and humidity levels. All my bodhráns are adjustable and taped as standard and will initially be available in clear matt-varnished finish, other colours/finishes of your choice will also be considered. 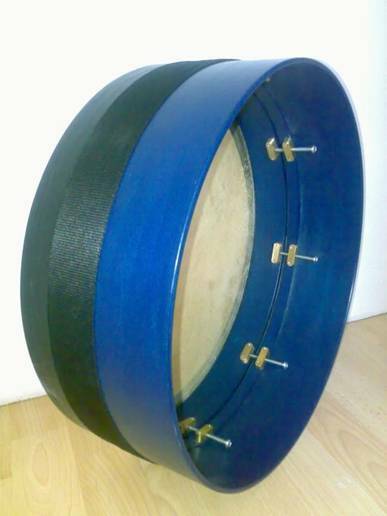 I am currently making 15 and 16-inch diameter bodhráns, that are approximately 6 inches deep, which I find optimal for sound, though other diameters and depths will be considered upon request. Style A. 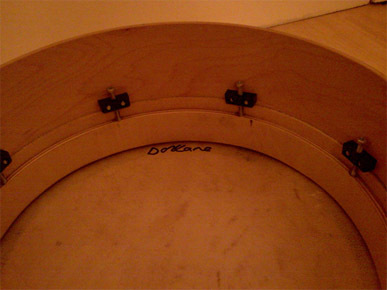 The standard tensioning system I use to adjust the tension or “tuning” of the skin is another smaller rim of laminated birch plywood which pushes up against the skin and can be tightened or loosened by tightening or loosening the bolts mounted in the blocks with a star headed screwdriver. This system is basically the same as the one created and developed by my Father 48 years ago, which works so well that I didn’t change it. Style B. I offer a variation on this system using tuning knobs designed by Darius Bartlett and Rob Forkner, this makes it possible to tighten or loosen the skin without the use of a screwdriver. Style B tensioning system with tool-less tuning knobs. Style C tensioning system employs a thinner integral tone-ring, which allows for more resonance of the rim and a larger playable surface area and greater potential for bass. My new design is a further progression in the Style D tensioning system, allowing for a larger playable surface area of skin and a more resonant rim. 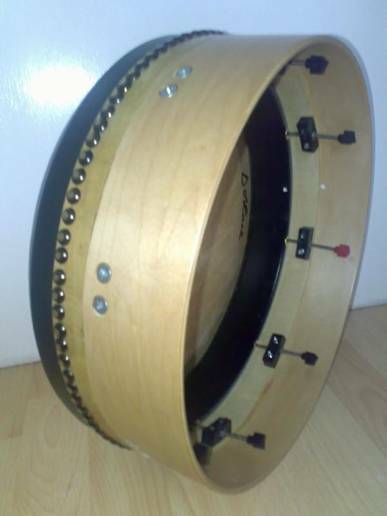 It uses heavier duty brass blocks and the Darius Bartlett / Rob Forkner tuning knobs, for tool free tuning.